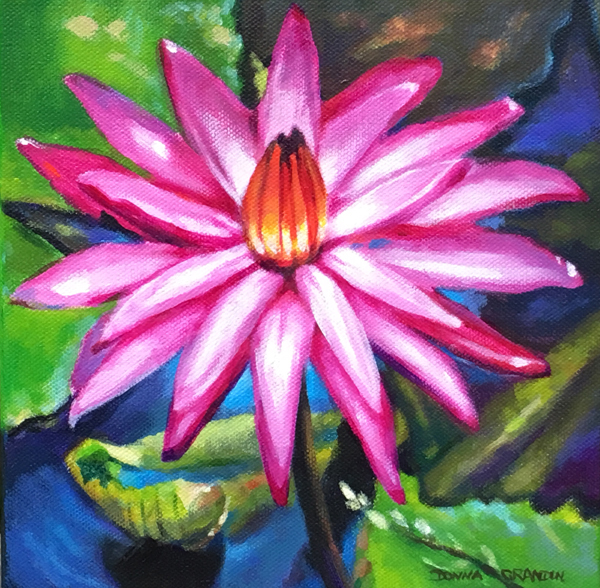 Pink Water lily, 8″x8″, acrylic on canvas, ©2016 Donna Grandin. $250. Summer is over, but there are still a few water lilies lingering in ponds here and there. “Pink water lily” is a shot of colour, a bit of cheer as we head into what promises to be a long winter. And since it has been a while since I blogged, I thought I would write about some alternative spaces to hang original art. Originally I had this painting in mind for someone specific, I thought they wanted a close up of a water lily, but it turned out it was too bold, too bright to go with my other paintings in their collection. So, now it is available for someone new. And this got me thinking about the places where people hang original art. Where do you hang your original art? In your office, your cottage, your home? In the front foyer, at the top of the stairs, above the bed, the dining room table and the inevitable couch? How about in the eat-in kitchen, or the she-shed? This summer I had the nice surprise of discovering one of my small paintings in the powder room of a collector and friend. Of course, I am not recommending anyone hang original, valuable art in their washroom. The steam from the shower could ruin it over time. However, I think few of us think of using the powder room as a mini-gallery. My friend Bridie is an artist, and like many artists, over the years she has collected a few small paintings that she has fallen in love with. Some she acquired in a show of support for a fellow artist, others she may have received as gifts. However, as an artist herself, wall space is a premium. Home is the one place you are always guaranteed a solo exhibition! Recently, I popped in for a cup of tea and a chat, and as I went to use the powder room before leaving, I discovered Bridie’s solution. She hangs a few of the small paintings on the walls of the powder room, rotating and refreshing her selection every now and then. I already knew that she hung art in there, I always enjoyed stopping in to look at the little treasures, but it was only when one of my own popped up that I realized she changed up the art. And I wondered how many other artists had been in there and discovered their art on display? How many other people looked forward to a trip to her powder room when they came for a visit? Just think of it. What a great opportunity to curate your own mini-exhibition for your friends and family! Can you think of any other unusual places or alternate spaces where you could hang original art? 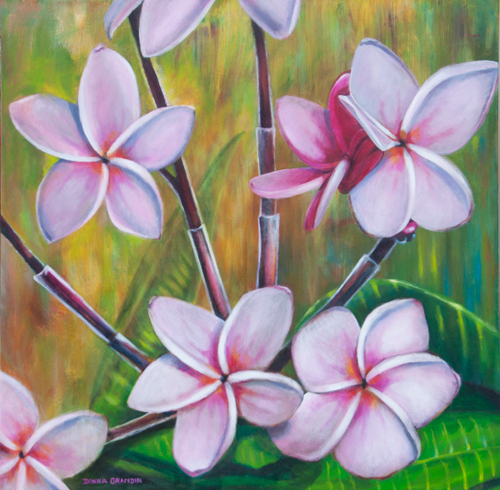 Frangipani flowers, 30″x30″, acrylic on canvas, © 2016 Donna Grandin. $1200. 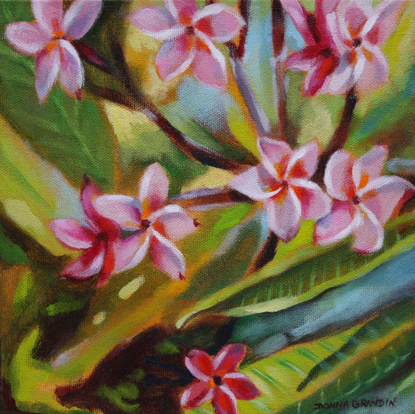 A couple weeks ago, I sent out my monthly (ish) newsletter, with an image of this frangipani painting … as it was then. There were one or two things that kept catching my eye however, so I ended up going back in and making some changes. That can be such a slippery slope. When you paint the way I do – not just doing a drawing & colouring it in, but blocking in colour intuitively & building up the image in layers, pushing and pulling and continuously refining the details – it can be harder to see what you have left to do. This painting actually started as an abstract, but then I changed my mind, added a few glazes to turn it into a background and started adding frangipani flowers. It can be difficult to know/decide when a painting is done. You do get better at this with practice. However, it is always possible to “overwork” a painting. You fiddle around, second guessing your choices, and before you know it the painting has lost its energy. Then you’re faced with a choice. You can either scrap the painting, gesso over it and start again, with more confident strokes, OR you can push forward. If you persist, you might be able to come out the other side with something even more wonderful than you’d first imagined. But, you have to be willing to sacrifice certain areas that you liked, because if you hold on to them, treat them like they’re precious, the painting won’t flow, the image won’t come together as a whole. I’ve developed a habit of photographing my work as I go along, not so much for sharing WIP images, as for me to get a different perspective on the painting. We artists have several different ways of doing this, I think the most instinctual is to just take a few steps back … then maybe a few more. When we’re in the act of painting, we are up close – literally painting the bark on each tree – and stepping back allows us to see the whole picture, the whole forest. After looking at the same image for a long time, we can actually miss certain things that are obvious to a fresh set of eyes, either our own (by putting the painting away for a few days and pulling it out again), or those of an artist friend. Another trick would be to look at the painting in a mirror, or to look at it upside down, sometimes both! It sounds funny, but if you squint at the painting, you won’t be so caught up in the details, but can evaluate the values. I have even on occasion photographed a painting and looked at it in black and white, to see if any mistakes jump out. Sometimes, you keep tweaking a painting, until you realize that you’ve pretty much painted a new version of the same thing. Different, but not necessarily better. Or maybe even, you look back at the earlier version, and it does not actually look as bad as you thought. Or maybe there are bits of each version that you want to keep. This is where perfectionism comes in. Many wonderful works of art would not exist if it were not for the artist’s attention to detail and obsessive focus. But the process can be quite unhealthy for the artist who skips meals, sleep, hygiene, a social life and more in pursuit of their vision. Excuse me for a moment … I really should go grab some lunch! Ah, that’s so much better. Now where was I? Yes. Pushing through perfectionism. If I were to try to paint the perfect frangipani flower, it would be symmetrical, each petal fresh and exactly the same as the last. An ideal. However, if you spend any time really looking at a bunch of frangipani flowers (or any other flowers), you would realize that there are always imperfections. One flower of the bunch is still opening out while another starts to fade, its edges browning. One’s petals have insect bites while another’s are torn from the movement of branches rubbing against it in the wind. Reality is not “ideal”. A single flower might be perfect when photographed/painted in full bloom. But perfection is fleeting, and therefore not a worthwhile pursuit in of itself. The wild, overgrown garden, often bears exciting visual images that you won’t find in the well groomed one. In fact, there is freedom in imperfection. Welcome to a whole NEW bluerootsartstudio.com! If you’ve been to this website before, you’ll be thrilled to see I have FINALLY updated it. The first version of the site was created by my brother & I in 2010, thanks to Skype, since he is in England & I am in Canada. He’s not a website developer, but he does know his way around some code! In fact, he’s pretty good at it, and that meant he was traveling more & more for his job, and so I needed to get my act together & figure out how I was going to take care of updating my own website. Of course, it wasn’t easy to commit to stepping away from the easel & hunkering down at the computer to learn what I needed to … but I’m happy to say, I’ve finally made some headway! To be honest, I’m very excited about the opportunity to talk to you in the first person now, to be able to share my creative process and insights with you. Art is a means of communication, it does not exist in a vacuum. Hmm. I suppose that point may be debatable, but I’m speaking for myself as an artist. So, I look forward to hearing from you … let this website be a portal between us! I’ve migrated posts from a career highlights type blog that I previously had attached to the website as my “News” page, commenting on some of them, just to give a little background to those of you who may have wandered onto this site for the first time. What I like about this format, is that the website will be a work in progress, mirroring both my journey into harnessing the technology of the day, and my own artistic exploration. By now, you may have figured out that I enjoy writing. I like to think through words. When I can SEE my thoughts in front of me, they lead to deeper understanding. My writing process is very much the same as my painting process, and I’d love to talk about that right now, but I’ll save it for a future post. I brought the subject up because I know I can be “wordy”, and the trend today is to be brief (140 characters) – stick to the point and sell, sell, sell. Hashtags instead of sentences. The way I see it though is this is who I am, and if you’re a skimmer, I hope you’ll be engaged by my visuals. And if you love nothing more than curling up with a thick book or even the electronic equivalent, and savouring the words as you get caught up in a story … then I hope to communicate with you through words AND images. So please, come back often … follow me in the format you prefer – Facebook, newsletter, RSS feed, I’m adding more all the time, I’m evolving, the website is evolving and I expect my art will continue to evolve as well! Take the trip with me, virtually or irl by attending my exhibitions and events. I look forward to connecting with you.